Masquerade, by Walter Satterthwait, is the sequel to Escapade, which I read and really enjoyed last year. Escapade was such a fun, light-hearted read and I was excited to read the sequel. Masquerade is set in France as the Nazis become a power to contend with in Germany. Phil Beamont and Jane Turner are separately deployed to 1920s Paris to investigate a murder-suicide of a famous society figure and his mistress. Phil must contend with a flirtatious widow while Jane tries to dampen the interest of an affected teenager, and both must figure out whether the suicide really was suicide, in a Europe with an increasingly ominous political climate. I didn't like Masquerade nearly as much as Escapade, unfortunately. Escapade had Harry Houdini, Arthur Conan Doyle and a Pinkerton. The mystery was important, yes, but not central in any way to my enjoyment of the book. In Masquerade, Phil and Jane are rarely together, which is very disappointing. And while there are a few hilarious appearances by Ernest "Call me Ernie" Hemingway and Gertrude Stein, I just didn't find this book nearly as fun as its prequel. However, Jane Turner is such a fabulous character, and she continued her fabulousness here. She is so witty and sharp and fun, and exactly the sort of woman I'd want to be friends with if I were a glamorous 1920s dame myself. She makes this book reading on her own, while Phil Beaumont was oddly disappointing. He spends much of the book saying "Yeah," and "No kidding," and having very little personality compared to the previous book. Sigh. There is only one other book in the series featuring Jane and Phil, though (Cavalcade), and I plan to read that one, anyway. Hopefully, it's better! Laurie R. King's The Beekeeper's Apprentice has been reviewed all over book blogosphere. It's the first in the Sherlock Holmes-Mary Russell detective series, with Sherlock Holmes in his mid-fifties paired up with an intrepid teenager Mary Russell in the English countryside during and after World War I. There they become close friends and solve a few mysteries together before they really bond over someone trying to blow the both of them up with a homemade bomb. Then the party gets started. I really enjoyed this book! I don't think I've read a Holmes mystery in quite a while, but that didn't stand in the way at all. Though I admit some confusion over who the purported author of the Holmes mysteries was in this series. Both Dr. Watson and Conan Doyle are mentioned, but I am confused as to who actually put the stories on paper. A minor quibble, though. I did think this book dragged a bit towards the end. There was a section that took place in Palestine that I found completely unnecessary, and there was so much "waiting for the opponent to move" downtime in which we just hear about Mary's time at university without any friends. Why is it that in historical literature, intelligent women are always portrayed as having so few friends?! I am intelligent, and I have friends. And granted, Mary had friends and then lost them, but really... I wish exceptional women weren't so isolated from others in historical books. I also wish mystery novels were written without the 5-page-long villain explanation at the end, too. Every author does this! Why? Is there no other way to give closure to a story, without words just spilling willy-nilly from a villain's mouth? If I were a dastardly, cold-blooded villain, I would not lose my head and explain to my captors exactly what I did, how I did it, and why. Just saying. Quibbles aside, though, I am glad to have started this series, and look forward to continuing with it! I am excited to get to the books in which feminism and women's rights take on a more prominent role. I am more than a little disturbed with the relationship between Holmes and Russell but I am putting that aside for now and not allowing that to detract from my enjoyment of the story. Great fun! I was sort of bothered by the Holmes/Russell relationship too. I mean he's old. And I feel like possibly addicted to opium or something? I can't remember if that was addressed...anyway, I liked but didn't love The Beekeeper's Apprentice, and I haven't decided yet if I'm going to keep reading the series. I'll be interested to see what you think of the next few books. I totally agree with you about how improbable it is that the villain starts talking at the end, thereby giving the victim a chance to be rescued and/or gain the initiative. It seems as if authors could find a different way to provide the information without that out-of-character technique! 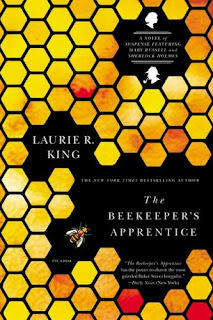 so glad to hear that The Beekeeper's Apprentice was good, as I bought it a few months ago and have been wondering if I would like it. It's funny, I am not a huge mystery fan, but I seem to collect a lot of them, hoping to find the book or series that will change my mind about the genre. Hasn't happened yet, but I am looking forward to the book that finally does it for me!! As far as Masquerade goes, I don't think that it's the book for me. Perhaps the first book, but definitely not the second. Great double review, Aarti!! I really want to read The Beekeeper's Apprentice, though I chuckled at your villain's speech comment! I am hoping to review this one tomorrow too. I thought the Palestine bit was a waste of time too. There was no real reason for it. Other than that, I loved it. Masquerade is set in such an incredibly interesting time and place -- it's a shame it didn't live up to the prequel. Oh I can't wait to get my hands on Escapade. I don't think I've heard of it before (and I'm a mystery nut!) I have to read mysteries in order so I'll try that first. I confess I was a little disturbed with Holmes' and Russel's relationship at first, but I got over it and enjoyed the mysteries. I'm so glad to read your review of Beekeeper's Apprentice. I have the 10th (that's right!) book at my home, and didn't realize it was part of a series. So I have to get cracking and start reading this series, just to get to the 10th book, lol! You're right about the Watson/Conan Doyle confusion in Beekeeper's Apprentice! I didn't mention it in my review, but it did make me wonder to some extent which universe this story was taking place in. But like you said, it's a minor quibble when one considers how engaging and fun the whole read was! Yours is the third review of The Beekeeper's Apprentice that I've read in past day and it's really pushing me to pick it up! I bought my boyfriend the first couple and he then proceeded to read the next two before taking a break from them (not because he wasn't enjoying them but he had new books app on iPhone to try out and a craving for fantasy). Apparently the Palestine section is important to a later novel. Thanks for letting me borrow this! I have been reading Conan Doyle's stories forever, and I like to track down good Sherlock Holmes spinoffs. To address everyone's confusion regarding who "wrote" the original stories, you have to understand a few things. In real life reality, Sir Arthur Conan Doyle made up Holmes, his fellow characters, and stories. However, since all of the original stories are from Dr. John Watson's point of view, big time Holmes fans pretend that Dr. Watson is in fact the real author. This worldview of Holmes is called "The Game," where everyone believes that Conan Doyle is Watson's literary agent, and just helps these chronicles get published. Confusing, I know. But ultimately amazing.